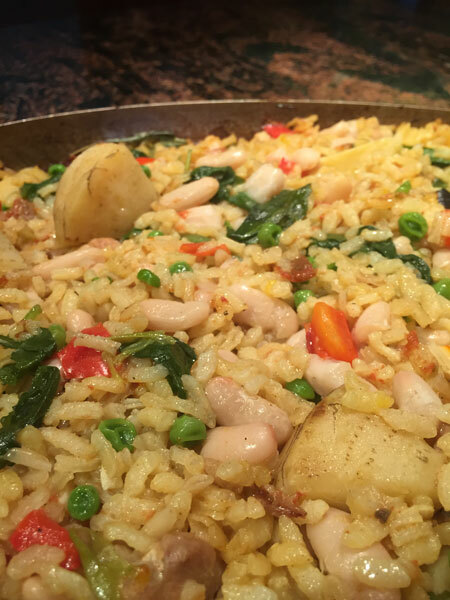 Inspired by a recipe from the North Central region of Spain, this paella is easy and quick to make. Peas and beans are classic ingredients while chard gives is a healthy summery touch. Bring water to boil in a small saucepan. Add saffron, cover and remove from heat. Let steep 10 minutes. Heat olive oil in a paella pan or a large shallow sauté pan over medium-high heat. Add bell pepper, garlic and onion and sauté 8 minutes. Reduce heat to low. Add rice and stir to coat each grain with olive oil. Add chicken stock, chard and tomatoes and bring to a boil, stirring frequently. Add saffron water, paprika and salt to taste. Reduce heat to medium-low. Cover and cook 15 minutes. 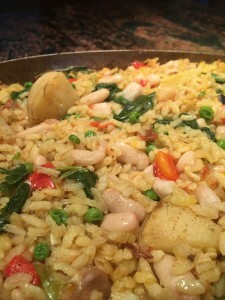 Gently mix peas and cannellini beans and Natural ArtiHearts into rice, cover and continue cooking until liquid is absorbed and rice is tender but slightly al dente with a golden, crusty on the bottom, 5 to 7 minutes. Remove from heat, let rest 5 to 10 minutes, and serve.